It is all over - including the shouting - GoneFishin Red are this year’s MKAA spring league champions. Sunday’s final round on the ‘Bradwell canal saw ‘Fishin tie for top spot on 18 points with Maver MK Black, with the latter going first on overall weight. But that didn’t stop the tackleshop crew reversing End Peg’s previous seven-point lead and coming out top of the series with a decisive six-point margin over runners-up ‘Peg. Browning Red were third on the day with 19 points. Top rod on the day was Maver Black’s Bryn Wignall with 12lb, ahead of ‘Fishin Red’s Roger Tebbutt 10-7 and Browning Red’s Barry Smith 9-10. Browning Red’s Alan Robinson was series individual champ (eight-points) well clear of Preston Innovations Red’s Dave Smith (11) and ‘Fishin Red’s Dave Tebbutt (13). Final placings: ‘Fishin Red 82, End Peg 88, Preston Black 94, ‘Maver Black 95, Browning Central 96, Tackle Hub 99, ‘Maver Green 106, Browning Black 113, Browning Red and ‘Innovations Red both 117, ‘Fishin Blue 143, Wooton Wizards 144, Royal Oak 160. >> Roger Stratton dropped in for a session on Beacon’s Mount Farm – and bagged a superb 8-6 female tench on floatfished corn. Hampered by cold north easterly’s the other four managed two fish between them while Paul was podium man with carp of 40lb and 36lb. 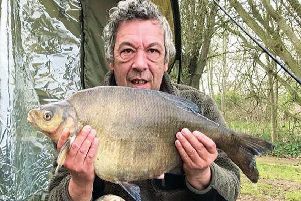 >> Back on Furzton numerous good fish have been coming out including Stewart Cowling’s 6-7 PB (for the water) bream and Martin Tilley’s 18-8 mirror. >> Osprey, Floatfish Farm (Peterborough): Tony McGregor 110lb, Des Proud 67lb, Pete Carter 62lb. >>MK Vet’s, Black Horse Pit: Kevin Osborne 46-4 of bream, Steve Dzialak 26-8, Bob Gale 18-8 (inc a 6lb tench). >> Towcester Vets, Waterloo: Kevin Nightingale 40-8, Dave Prodger 38-2, John Balhatchett 33lb. >> Linford, local canal: Nick Barker 5-12, Mick Hefferon 3-14, Steve Funnell 3lb. >> This year’s MKAA season cards went into local tackle shops this week. >> According to Angler’s Mail the Environment Agency is about to start official public consultation on a raft of rod licence law changes. Proposals apparently include: valid for 12 months from date of purchase instead of current fixed April to March; scrapping junior rod licences (under 17s to go free); a new three-rod ticket; minor price changes. If it all becomes law, as it is likely to, the changes will run from April next year. >> Fixtures: Friday-through-Sunday, Furzton closed to angling; Sunday, first round Alders teams-of-three league, 07860 235655.